It's been a while since i write about beauty and vanity. I am the type of woman who loves to talk and hear about it, and will never get tired in doing so. Sharing something you are in passion with is a great thing and to feel beautiful is a woman empowerment. My body skin type is dry and moisturizing is always the key to become hydrated. I have a line up of body skincare from oil, to lotion to body butter with scheduled application depending on weather type. Brands that i trusted along so with others is also a good key to drive me in, at times i would love testing products depending on recommendations and personal research.This time i would love to share one of my favorite body lotion. I have been using it for quite sometime, for a couple of years i think and it did not frustrate me at all. 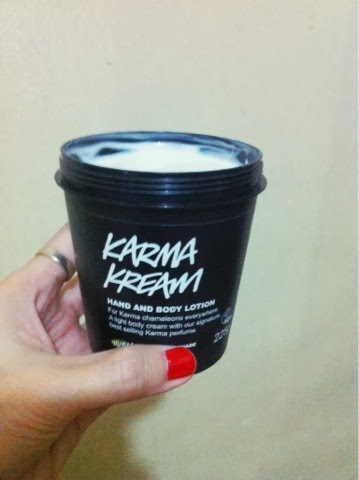 Karma Kream hand and body lotion from Lush have a combination of almond oil, ( anti aging ) cocoa, ( to soften ) orange, patchouli and pine ( heavenly scent ) that leaves on my body for hours and stick to my clothes even after i put it in my laundry pile - and for that it's a great choice of lotion for date nights too! From the first application i know it will be a regular supply to my vanity kit. It has the consistency of a lotion but the effect of a body butter. I love that it's easy to apply and not too sticky like the butter and easily sinks in to the skin. A great alternative after a weekly body scrub routine. One thing i love most in this pot is that it keeps me hydrated all throughout the application and the look of well hydrated skin is visible. At times when i want to layer, i also use the soap with the same line and get ultimate result.The price ( php 1,075 ) is quite spendy among other brands that i up to but it's all worth the cents to think that it comes in 225 grams pot. It will come a long way of application, about two months usage base on my personal use. Lush has so many great products that i love that's why it keeps me from coming back to their store. Did you ever try this one? Thoughts? Would be please if you could share some of your favorites too. Have a great week ahead and happy Monday everyone!